The HEXUS Epic Giveaway returns! Our annual spate of competitions is back and bigger than ever, giving you the opportunity to win amazing prizes every day throughout the holiday season. It's our way of saying thank you to all our fabulous readers. The 2018 goodie bag has grown to epic proportions, courtesy of many big-name manufacturers. We have gear up for grabs from the likes of AMD, Corsair, EVGA, Nvidia and Scan Computers to name but a few. It's going to get hectic, so be certain to bookmark our dedicated Epic Giveaway homepage to keep tabs on each new competition as it arrives. The prizes keep on coming! 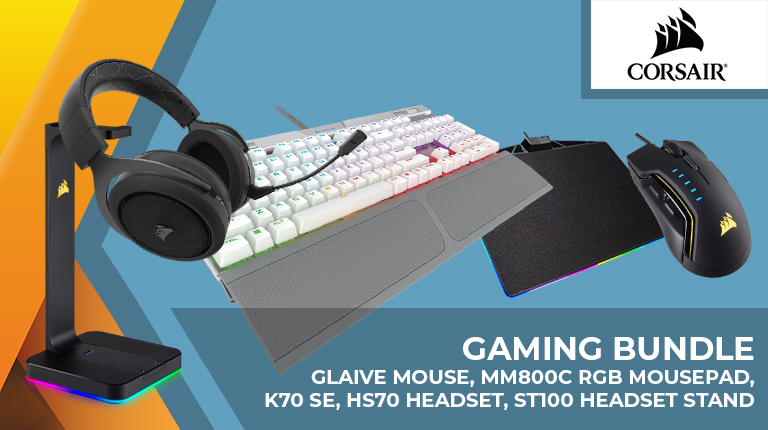 On Day 8 we have an awesome Corsair gaming bundle that includes a K70 RGB MK.2 SE Mechanical Gaming Keyboard, a Glaive RGB Gaming Mouse, an MM800 RGB Polaris Gaming Mouse Pad, a HS70 Wireless Gaming Headset and an ST100 RGB Premium Headset Stand! That's a combined value of over £450, and we're giving it away for free! Want to be in with a chance of winning? Simply answer the following question, and don't forget, you can also claim a free second entry via Facebook. Good luck and check back soon for more prizes in the 2018 Epic Giveaway! The prize draw is open to HEXUS readers aged 16 years or over. The competition winner will be picked at random from all eligible entries that arrive by 09:00 London time on the closing date, December 24, 2018. Only one entry is permitted per household per HEXUS entry form; second Facebook entries, if applicable, are permitted. Duplicate entries on either form will result in disqualification and no entrant may win more than one prize. The winners will be notified via email by January 30, 2019. The winner must claim their prize within 7 days of the promoter sending notification. If the prize is unclaimed after this time, HEXUS reserves the right to offer the unclaimed prize to a substitute winner selected in accordance with these rules. The prize is a K70 RGB MK.2 SE Mechanical Gaming Keyboard, a Glaive RGB Gaming Mouse, an MM800 RGB Polaris Gaming Mouse Pad, a HS70 Wireless Gaming Headset and an ST100 RGB Premium Headset Stand. In the event that the prize offered is unavailable due to circumstances beyond our control, we reserve the right to offer an alternative prize of equal or greater specification. Prizes will ship to winners within 45 days of the draw, though we aim for sooner. HEXUS and its partners are responsible for shipping within the criteria laid out and the winner is responsible for local taxes if applicable. Prize draws are not open to employees of HEXUS and their affiliates, agencies, suppliers, sponsors and immediate families. Entry into the competition will be deemed as acceptance of these terms and conditions. A list of previous competition winners is available at HEXUS.net/Competition_Winners. A full GDRP declaration is available on this page. Add it to your HMD for VR "smells, hot and cool wind, water mist, vibration and punches". Lightweight (76g) wired rodent includes Pixart 3327 sensor, Arm SoC, and Omron switches. Windows 10 updated to enable USB 'Quick Removal' default Asus UK launches the RoG Strix Scope gaming keyboard QOTW: What wattage is your power supply? Elgato Thunderbolt 3 Pro Dock QOTW: How fast is the storage in your PC? I remember when I was young and what really drew me to games was the sax. Ah, those were the days. Nice bundle for the winner. Many thanks to Hexus and Corsair.